Englewood Arts presents the Starlight Rhythms acoustic concert series. Concerts will range from acoustic pop, rock, blues, jazz and world-music. That Damn Sasquatch, an entertaining ensemble that crosses genres of music including bluegrass, country, blues, cajun and jazz with a balanced, progressive and traditional approach. Tickets are General Admission: $12 for Adults; $10 for Seniors; and $5 for Students under 18. 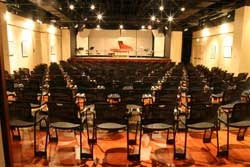 Tickets are available at the door before each concert or online in advance at http://englewoodarts.org/. The Englewood Arts Concert Series is sponsored by Englewood Arts, the City of Englewood, and the Scientific and Cultural Facilities District.